Very good article on the new Facebook Data Center in Prineville, Oregon via Wired.com. One of the interesting aspects of the data center design is the energy efficiency aspect. In a data center that services 800 million users, shaving a few percentage points off of the energy bill represents huge savings. According to the article, the location was chosen for it’s climate. The area has low humidity, thus allowing the use of evaporative cooling system verses the conventional refrigeration cycle systems most often used. Another area is in the servers themselves. Facebook decided to design their own servers, using a stripped down platform, larger heat sinks, slower fan speeds, etc to reduce the amount of electricity used. 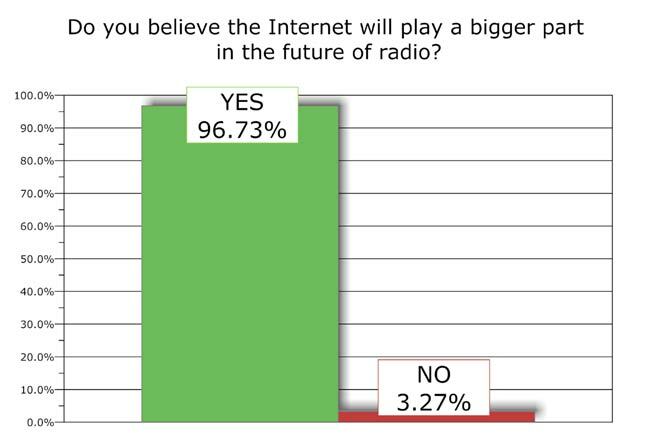 All in all the article is well worth reading, as the future of broadcasting will be centered on data centers such as this one. You know those fancy new facilities pictures with the accompanying article you can normally find in the trades? The article usually expounds on how this guy made the decisions on purchase then these guys worked hard and pulled it all together. Here is the works hard and pulling it all together story. WEBE and WICC have been in the same studio building for several decades. The Pacific Recorders and Engineering equipment, while great, is tired and worn out. On top of that, an F1 tornado ripped the AC units off the roof last June, ripping the membrane and doing extensive water damage to the facility. The cleanup/water damage mitigation took some time. All of the carpet and ceiling tiles needed to be replaced. 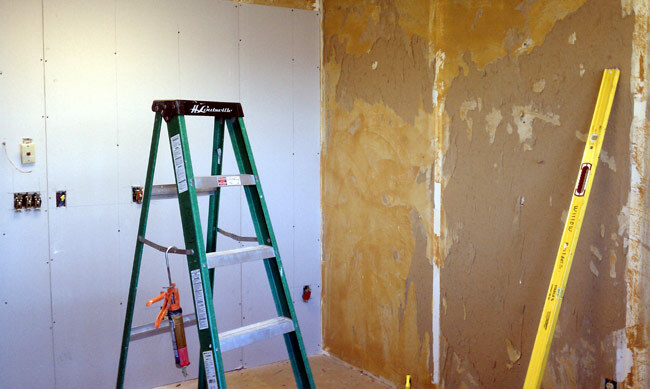 The walls needed to be resurfaced with new drywall. 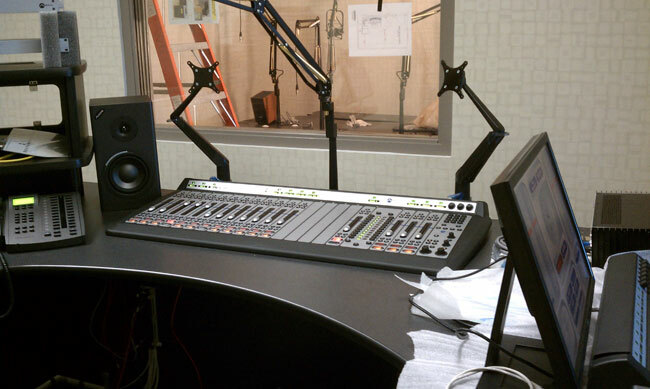 In some cases, modifications such as removing a storage closet from the engineering room, moving a door, building a new talk studio and WICC control room needed to take place. In short, lots of dust, dirt and disruption to the station equipment and staff. It has not been trouble free, as several times computers and consoles failed due to age and dirt. 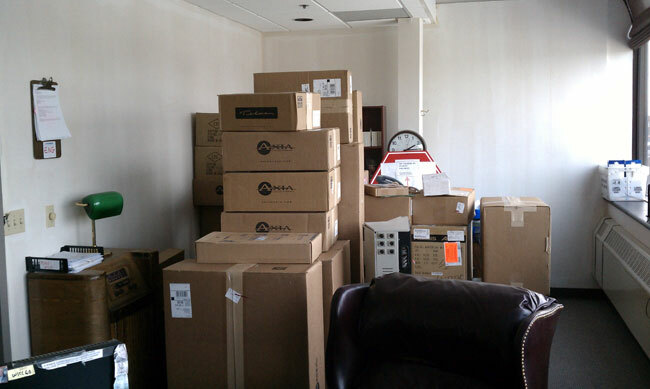 Sometime about the beginning of December, new equipment and furniture began to show up and the project was underway. All of the new equipment was stored in the program directors office. Heh, the program directors office. 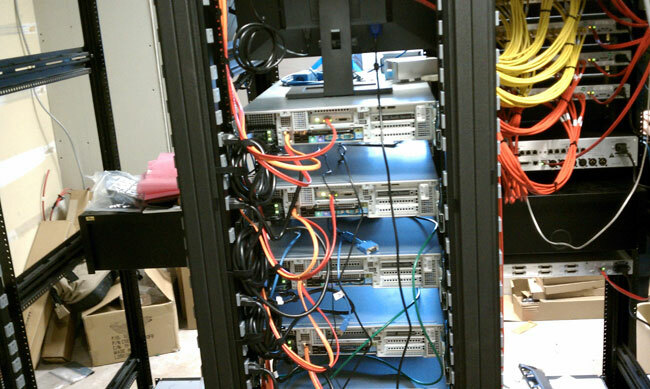 A new rack room was designed around the old one. The old racks are out of the picture to the left. The original rack room had a door into the hall, that has been replaced by viewing windows, the door has been moved to the engineering office, next door. I kind of like the windows, it lets visitors see the fancy computers but keeps them out of the room itself. The existing automation system is being replaced by Op-X. This is the business end of the Op-X audio servers. All of the network connections are Gigabit using Belden Mediatwist (1872A) Category 6 cable. 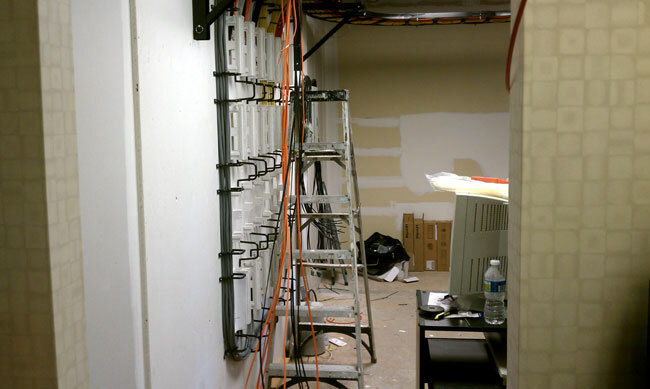 All the wiring from the studios and racks are brought to this wall. The terminations are Krone LSA-PLUS blocks. AES/EBU digital and analog audio is run on Category 5e cable. Krone LSA-PLUS termination block with Belden Mediatwist cable. 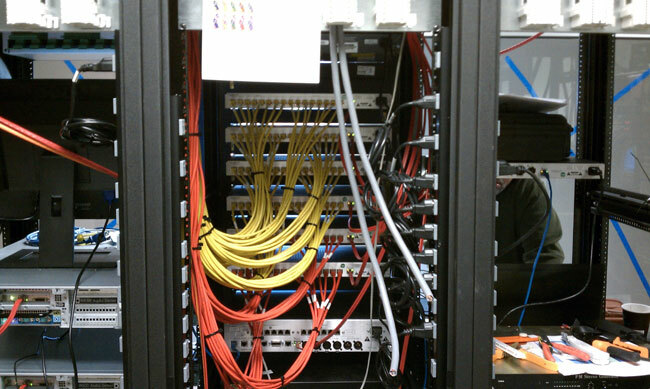 All rack and studio wire runs are terminated on this style block. 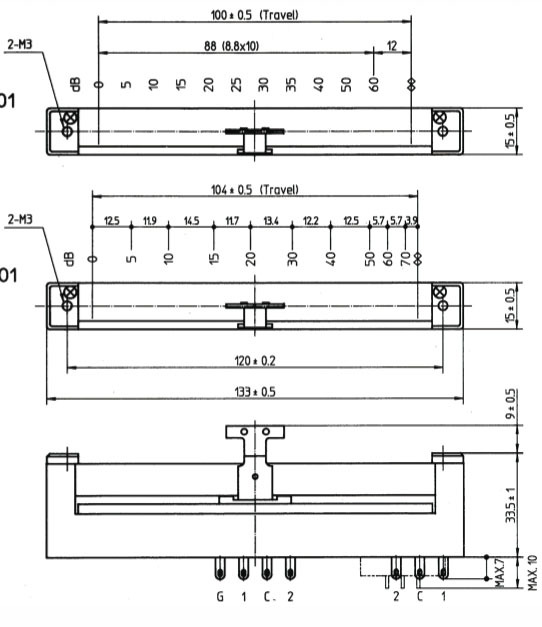 Notice the wire labels, every run is labeled with both termination ends and use. Mediatwist cable is fairly easy to work with, the pairs are bonded, so a special tool is recommended to quickly separate the wires. 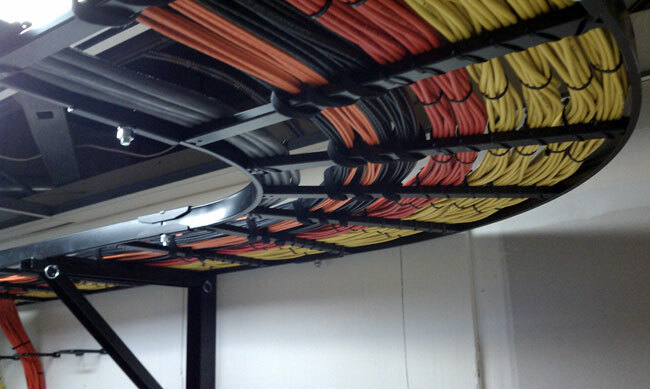 Wire tray between the racks and wire wall. 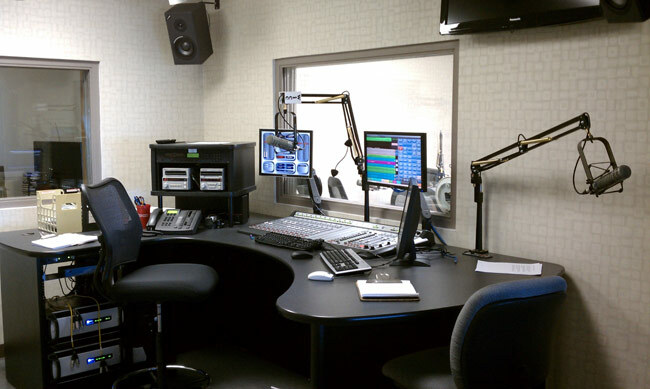 The new WICC control room and talk studio. The Axia consoles are pretty slick. 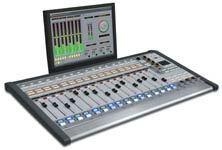 They are not a true mixing console in the traditional sense, they are more like a control surface. 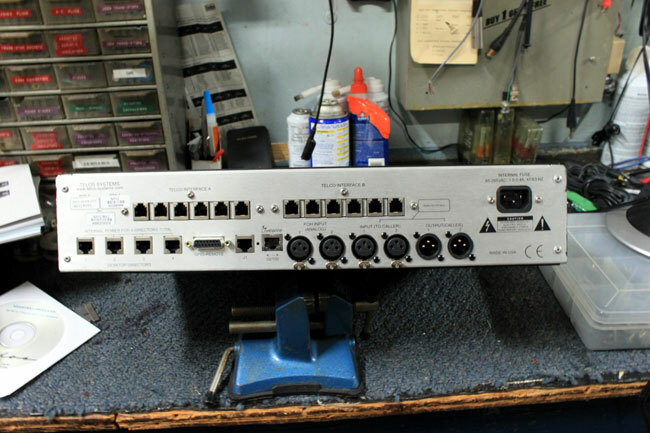 Most all of the audio inputs are in the rack room, however, the microphones are digitized in the studio and sent over an IP network to the rack room. All input and output channels are computer configurable and remote controllable. 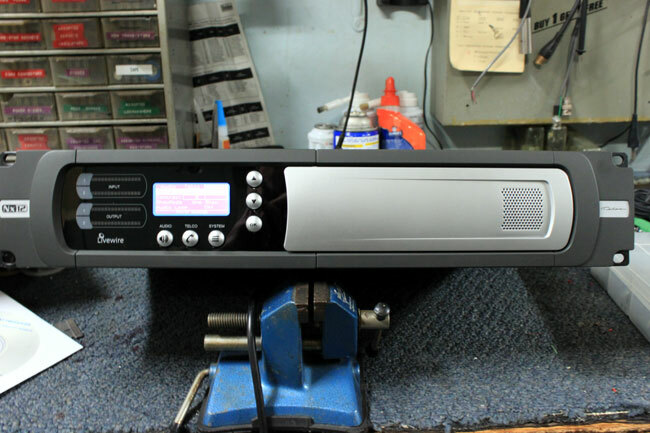 Console inputs also have onboard mic preamps and full processing. The new talk studio set up. This is located where the news room used to be. In order to stay on the air and maintain the old studios, a sort of musical chairs system needs to be played. In the end, the WEBE studio and one production room will end up where they started, everyone else will be in a new space. 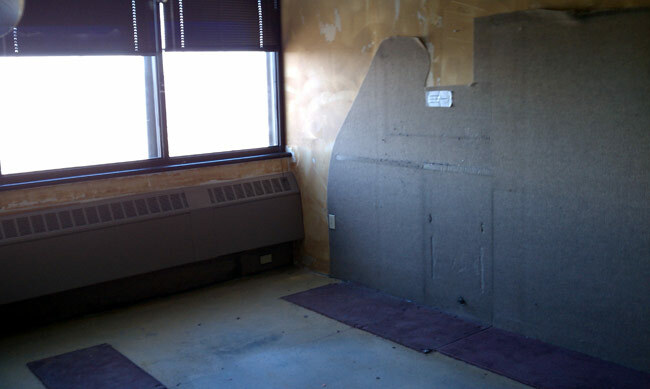 The news room will end up where the current WICC control room is. 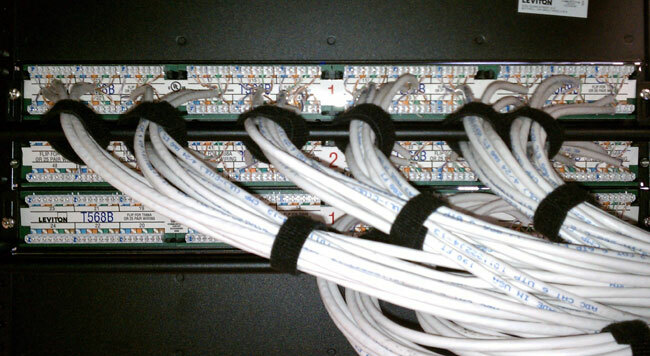 Network patch panel, notice the T568B markings. Currently, the program directors are loading all there material in the Op-X system. The time schedule is to transfer WEBE into a temporary studio in about two weeks. More updates as the project progresses. 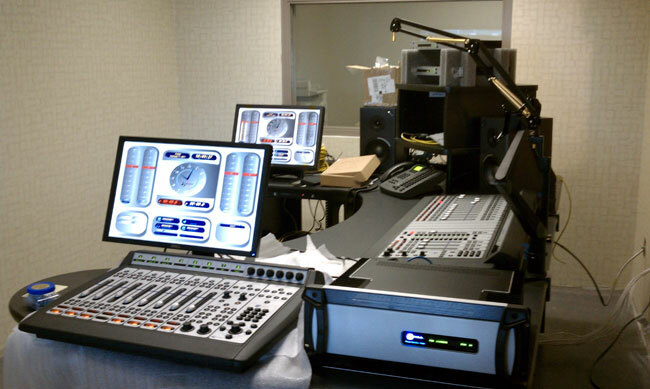 Update: The new Axia equipment and Op-X automation is on line as of 2/24. More pictures to follow. 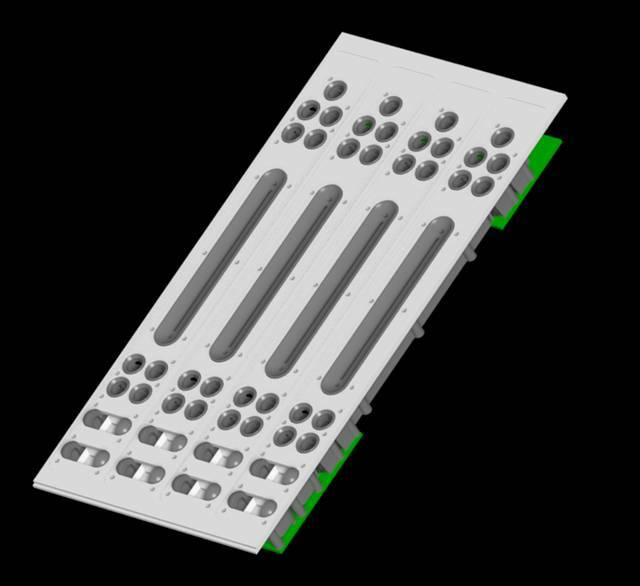 Update 2: For more information on how the Axia consoles are made, check out A broadcast console makers perspective. 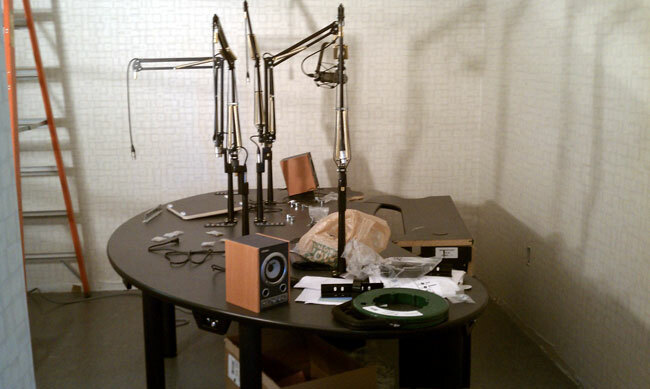 WICC studio is nearly done, just a few odds and ends here or there. This is located where the former talk studio was located. 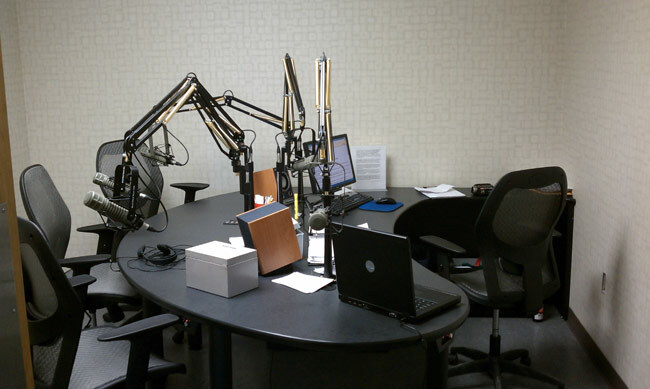 WICC talk studio, host and four guest positions. This is located where the former news room is. This is the former WICC control room. It has been gutted and several walls are being removed. This will become the permanent WEBE control room when it is finished. 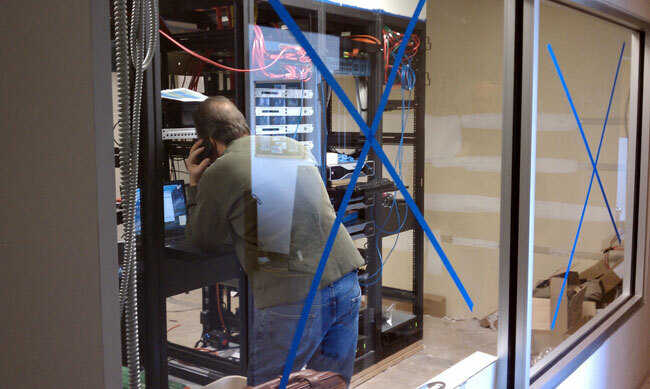 The former WEBE control room, gutted. All the carpeting has been removed and 1/4 inch drywall is going over the old, glue encrusted drywall. This room will become a production room. WEBE WICC rack room viewed from the hallway, approximately where the door to the room used to be. 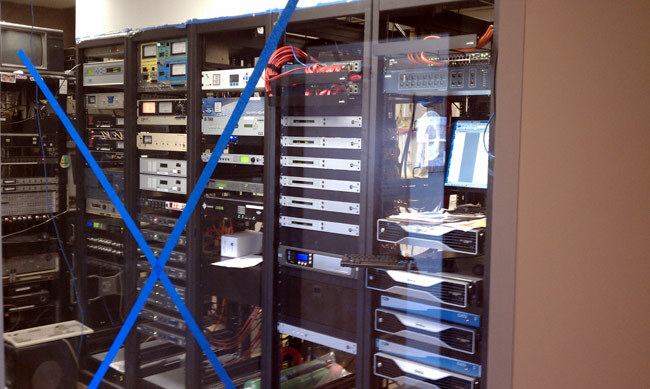 The old racks to the left are being stripped out and removed. 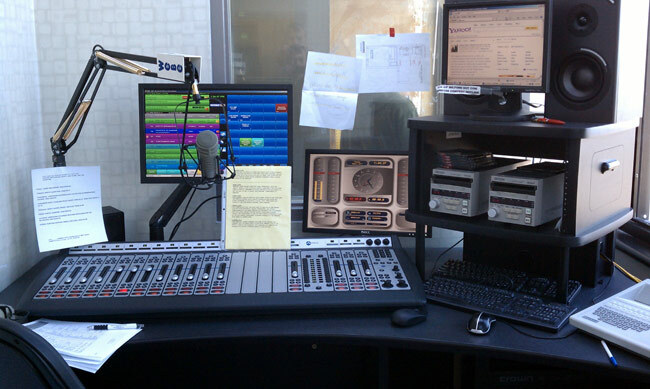 All of the stations are now on the air from the new racks. Audio over IP, what is it, why should I care? IP networks are the largest standardized data transfer networks worldwide. These networks can be found in almost every business and home and are used for file transfer, storage, printing, etc. The Internet Protocol over Ethernet (802.x) networks is widely understood and supported. It is robust, inexpensive, well documented, readily deployed and nearly universal. Many equipment manufactures such as Comrex, Telos, and Wheatstone have developed audio equipment that uses IP networks to transfer and route audio within and between facilities. Audio enters the system via an analog to digital converter (A/D converter), often a sound card, at which point a computer program stores it as a file. These files can be .wav, .mp3, .mp4, apt-X, or some other format. Once the audio is converted to a digital data format, it is handled much the same way as any other digital data. Application layer – This is the protocol contains the end use data. Examples of these would be HTTP, FTP, DCHP, SMTP, POP3, etc. 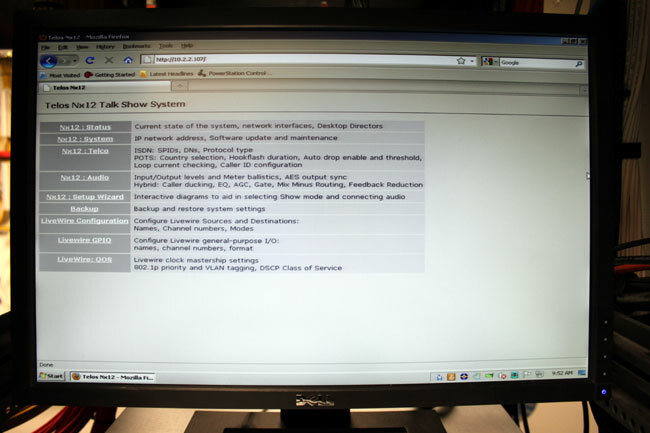 Telos Systems uses their own application called “Livewire” for their equipment. Wheatstone uses “WHEATNET.” Digigram uses “Ethersound.” This is an important distinction. Transfer layer – This contains the TCP or UDP header information that contains such things as transmitting, receiving ports, checksum value for error checking, etc. It is responsible for establishing a pathway through multiple IP networks, flow control, congestion routing, error checking and retransmission. TCP allows for multiple IP packets to be strung together for transmission, increasing transfer rate and efficiency. 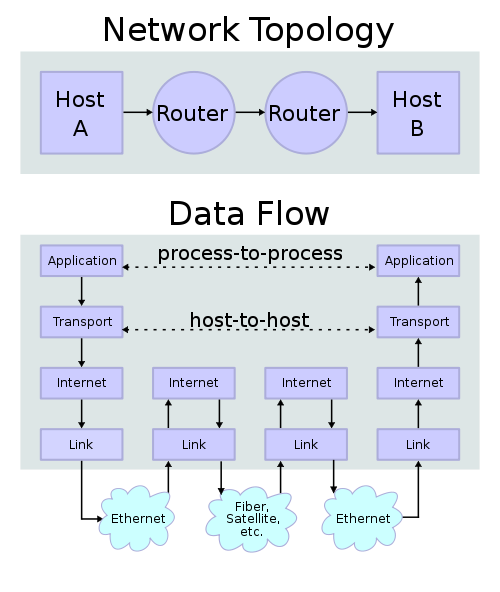 Internet layer – This is responsible for transporting data packets across networks using unique addresses (IP addresses). Link Layer – Can also be called the physical layer, uses Ethernet (802.x), DSL, ISDN and other methods. Physical layer also means things like network cards, sound cards, wiring, switches, and routers. An IP network can be established to transmit data over almost any path length and across multiple link layer protocols. Audio, converted to data can thus be transmitted around the world, reassembled and listened to with no degradation. 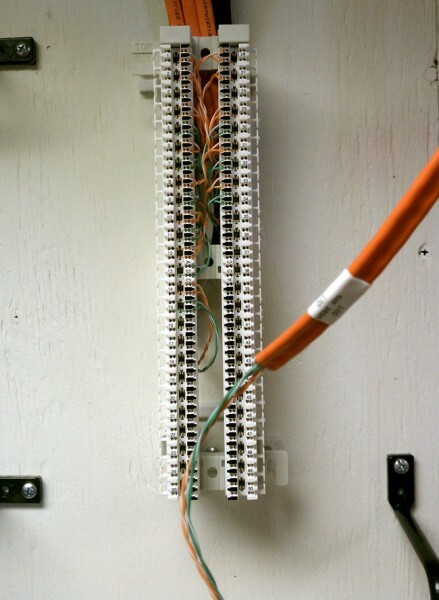 Broadband internet connections using cable, DSL, ISDN, or T-1 circuits can be pressed into service as STL’s, ICR’s, and TSL’s. This translates to fast deployment; no STL coordination or licensing issues, no antennas to install if on a wired network. Cost reductions are also realized when considering this technology over dedicated point-to-point TELCO T-1’s. Additionally, license free spread spectrum radios that have either DS-1 or 10baseT Ethernet ports can be used, provided an interference free path is available. IP audio within facilities can also be employed with some brands of consoles and soundcards, thus greatly reducing audio wiring and distribution systems and corresponding expenses. As network speeds increase, file transfer speeds and capacity also increases. Dissimilar protocols in application layer means a facility can’t plug a Barix box into a Telos Xtream IP and make it work. 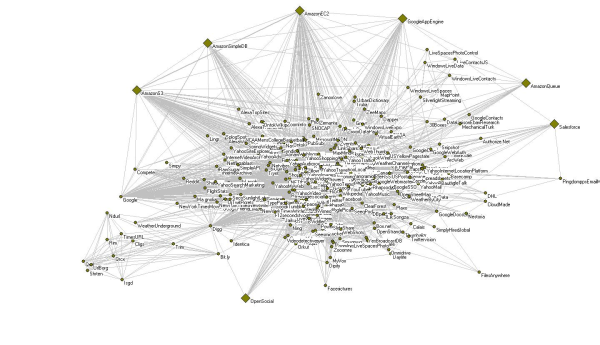 There are likely hundreds of application layer protocols, most of which do not speak to each other. At some point in the future, an IP audio standard, like the digital audio AES/EBU may appear, which will allow equipment cross connections. Additionally, the quality of the physical layer can degrade performance over congested networks. The installations must be carefully completed to realize the full bandwidth capacities of cables, patch panels, patch cords, etc. Even something as little as stepping on a Category 6 cable during installation can degrade its high-end performance curve. Cable should be adequately supported, not kinked, and not stretched (excessive pulling force) during installation. TCP/IP reliability is another disadvantage over formats like ATM. In a TCP/IP network, no central monitoring or performance check system is available. TCP/IP is what could be called a “broadcast” protocol. That is to say, it is sent out with a best effort delivery and no delivery confirmation. Therefore, it is referred to as a connection-less protocol and in network architecture parlance, an unreliable network. Lack of reliability allows any of these faults to occur; data corruption, lost data packets, duplicate arrival, out of order data packets. That is not to say that is does not work, merely that there is no alarm generated if an IP network begins to loose data. Of course the loss of data will effect the reconstruction of the audio. Finally, latency can become an issue over longer paths. Every A/D converter, Network Interface Card (NIC), cable, patch panel, router, etc has some latency in its circuitry. These delays are additive and dependent on the length of the path and the number of devices in it. Provided care is taken during design and installation, AOIP networks can work flawlessly. Stocking adequate spare parts, things like ethernet switches, NICs, patch cables and a means to test wiring and network components is a requirement for AOIP facilities.